Size of Male: 3-7 lbs., 8-11 in. Size of Female: 3-7 lbs., 8-11 in. The Pomeranian is a lively pet. They are outgoing and confident and make wonderful companion pets for the elderly and for families with older children. These dogs are extremely loyal and eager to please and are tolerant of most climates. They are able to learn dog tricks if patiently trained. They are excellent family dogs, but can be temperamental around small children as well as other dogs, partly due to their diminutive size. The Pomeranian descends from sledding dogs, with the most direct ancestor assumed to be the Deutscher Spitz. The Deutscher Spitz weighed approximately thirty pounds, and it is unclear when they began to be bred down in size. The breed was accepted by the European Kennel Club in 1870, though it was not until Queen Victoria purchased one that they saw a rise in popularity. The AKC recognized the breed by 1900, and they continue to be bred down in size. This small dog breed is popular both as show dogs and pets. Pomeranians are by nature curious and playful dogs. They are self confident and always eager to play. While shy towards strangers and other dogs, they are fiercely loyal to their families. These dogs do have a tendency to bark frequently and they are not recommended for households with small children. The small stature of these dogs makes them temperamental. The ability of the breed to serve as a guard dog is high, as they will bark whenever danger is sensed. Living Environment – This dog breed does best in homes with families that have older children or as companion pets for the elderly. Shedding is common, making them less than ideal for households with allergy sufferers. They thrive indoors, though their tendency to bark should be considered for families living in apartments. Grooming – Grooming is a twice weekly necessity. When they are shedding, they need more frequent grooming. Additionally, the breed requires frequent dental care due to a predisposition to tooth loss. In addition to veterinary dental care, frequent cleanings are recommended. Diet & Exercise – Because the breed is prone to dental problems, dry food is recommended to help ensure healthy teeth and gums. These dogs do require playtime and do well with short walks. They can become bored easily and require frequent activity. Health – There are numerous health problems associated with this breed. Medical disorders common in this breed include progressive retinal atrophy, PDA, cataracts, low blood sugar, collapsing trachea, allergies, and entropion. Parents should both have OFA and CERF certificates. 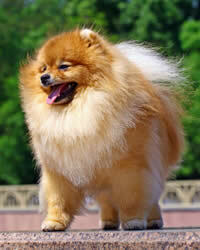 Pomeranians are very quick to learn and respond best to firm dog training commands. These dogs respond very well to obedience training, though barking must be controlled. Housebreaking requires consistency and praise and can be difficult.